Its been a long time since I last wrote in English. What prompted me to write this time in English, is the fact that this little article is about something that is understood by most people, regardless of race, language, religion, nationality, age, gender... Yes, it is something universal. A universal language - something intricate, yet innately understood by our very minds and souls. I was honored to be offered an opportunity to attend a concert conducted by Mr Joshua Tan, performed by the Singapore Symphony Orchestra (SSO), as a media - Cute-pop writer. Though I am fond of most things Japanese, I was, strangely, not quite as much a huge fan of Ghibli as compared to my peers. Perhaps it was because I was not exposed to Ghibli movies when I was young. Hoping to receive some enlightenment, I borrowed the DVDs of My Neighbour Totoro and Howl's Moving Castle from a close friend, attempted to watch them during the holidays but unfortunately did not manage to finish watching both. Perhaps it was just me ^^; I did not (and still do not) know how to appreciate Ghibli movies. Having said that, I should have passed on my ticket to someone else who would better appreciate the concert than I do. However, after explaining my concerns to Cute-Pop owner and producer Vincent-san, he told me that he feels I am best suited to go for this concert. Taking his word for it, I accepted the invitation and had a pretty interesting evening that very night. The concert began with Oriental Wind. This 6 minute long piece featured a solo violinist and pianist. Though there were parts where the orchestra was not very synchronized, it was overall quite a satisfying appetizer to our musical palates. On the contrary, the second piece, My Neighbour TOTORO（隣のトトロ）, Orchestra Stories, was a fascinating blast. The orchestra played a short motif before a narrator stepped forward and began introducing the different parts of the orchestra namely the woodwind, brass, strings and percussion including the harp and piano. As Mr William Ledbetter gave short introductions on the parts, the orchestra played a light playful tune in the background. As soon as he finished with each narration, the part that was introduced would play a lovely tune while the rest quieten down to barely a whisper. This went on till the strings were done with their pizacatto. The actual piece persay then began, itself also broken into short stories. First up was The village in May (五月の村), which told the story of the two little children moving to a new house and exploring its vicinity while their sick mother laid in hospital. During their little adventure, they stumbled upon a house that was seeming haunted. At this point, the orchestra played a playful sforzando piano, which startled (in good heart) the audience. A violin's solo followed and the story progressed into its second part - It was Totoro! (トトロがいた！). The children fell into a cavern and landed on Totoro's enormous belly. There they slept with the innocence of all children, as the bar chimes executed a perfect glissando depicting the rustling of tree leaves in the breeze. A violin solo then came and went while the piano played what seemed to be a melancholy. Then came part 3 - A lost child (迷子). While trying to find their way back to their mother, the children got lost. They seek Totoro for help, who replied with a low roar delivered with surprising accuracy by the tuba. I have to admit we were tickled by this innovative and playful arrangement. As the cat scurries by and the orchestra played a tune of fairly quick tempo, the children were finally home and safe and this 25-minutes long piece ended on a resounding galloping note. Depatures, was not an easy piece to perform. With its technical complexity, it is a personal favourite of conductor Joshua Tan who described it as being "very profound". Arranged for the violoncello and orchestra, cellist Ng Pei-Sian perfectly executed this highly challenging yet beautiful piece and left us hungry for more. Saka no ue no kumo, followed and we were caressed by a smooth flow of notes. There was a notable interesting change in mood in the middle of the piece, before we were brought back to be among the floating clouds. My personal favourite, the main theme of Spirited Away - One Summer's Day ((あの夏へ) - swept us all off our feet. Though there were minor issues with synchronization again, with the beautiful fingerwork of pianist Shane Thio, I believe it t was a piece that left deep footprints in the hearts of most audience. The black cat was next. Kiki's Delivery Service, for piano percussion and strings, was a light hearted piece punctuated with modents and alternating piano and violin parts which then progressed to a short playful canon before coming to an end. Perhaps I have an affinity for songs with "Summer" in it, but my second favourite of that night was Summer (from Kikujiro). The strings began with bars of well executed pizacatto before the woodwinds took over the melody which was then passed on to the piano. Pianist Shane Thio did his magic once again as he relayed the main motif between the strings and his grand. Last but not least, Water Traveller (水の旅人), began with a grand opening. it progressed to a smooth sailing tune before ending with a similarly grand coda with cymbals clashing, strings, woodwind, brass and percussion in full force, as if to signal the end of a night of musical adventure. Of course, the audience was not easily pacified. We had them play 2 piece of encore - One summer's day and My Neighbour Totoro. This concert, as revealed by conductor Joshua Tan, was the product of a fine meeting between him and Mr Joe Hisaishi about three and a half years ago when he attended a concert by Hisaishi. 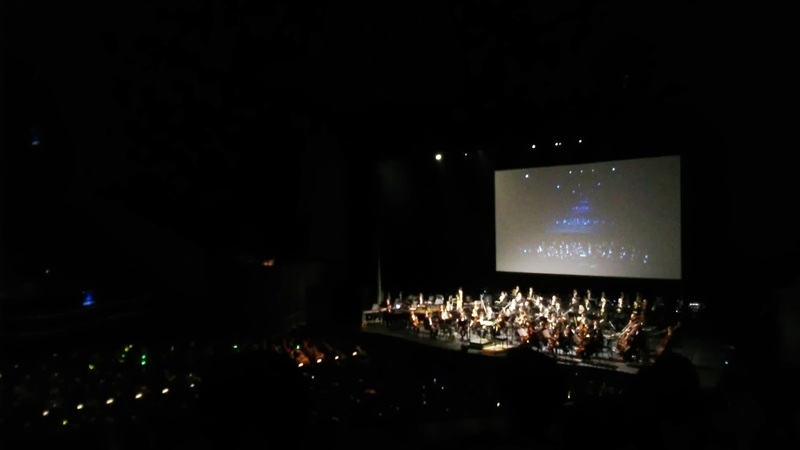 He was told by Hisaishi that the scores were actually yet to be completed (they were given an "impromptu finish" for the concert). "If you want to perform this, you have to wait about two years," he was told. 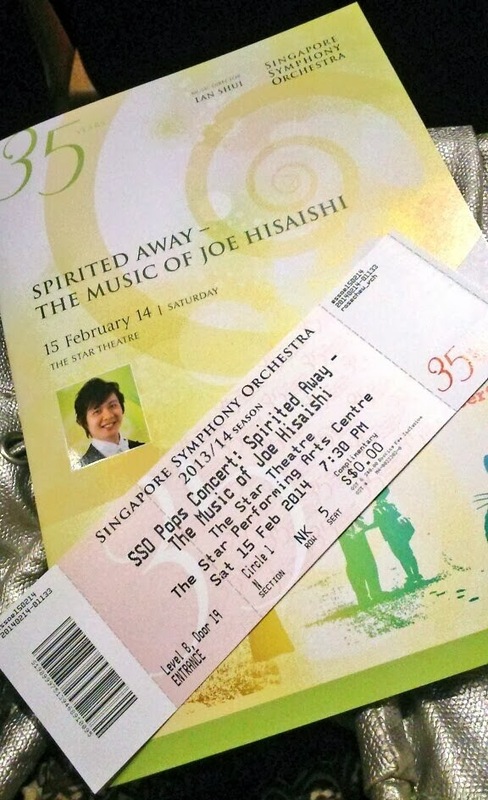 So here we are, after a three and half years wait, a Joe Hisaishi concert held at the heart of Singapore. With Joshua Tan's personal favourites and world reknown tunes such as Departures, Summer and One Summer's Day, it is no wonder why 3800 people would turn up for a musical touch to their Saturday evening at the Star Theatre. Special thanks to Cute-Pop and Neo Tokyo Project for the invitation.